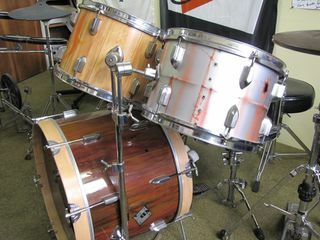 This is actually a lovely '60's pearl double bass rock kit that I rescued from a high school loft and have fully restored. I decided to airbrush it to look like it was made out of junk, wood grained one bass drum and the middle tom (and set fire to it), and made the high tom to look as if it was made out of an old oil drum. Brad wanted to really surprise his girlfriend for Xmas 2010. 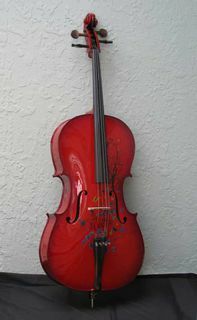 Kellie used to play cello,so he went and bought a new cello for her and asked me to customise it. Bright red and a whole heap of butterflies and an awesome 2pac clear finish from Grant at "The Polish Shop" this is how it looks. Set myself a mission to buy a guitar, paint artwork and hopefully meet him when he came to NZ. Great guy, very complimentary, I was still buzzing weeks after! It's now in my collection!!!!! Now I live my days waiting for the ph call to paint one of his awesome collection... now that would be a buzz!! It sounds at least as good as it looks!!!! Bass Guitar painted for Ken Kimi, great guy, great bass player, and devout christian, hence the christian theme. It was my pleasure to paint this as a surprise for Ken, a great guy, awesome bass player, and I know he will enjoy it! 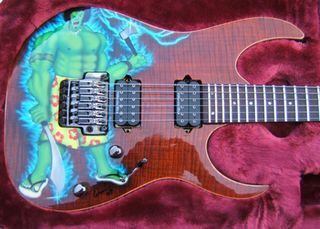 Polynesian Hulk look with curly hair, small goatee beard, shark tooth necklace, over - emphasised muscles, tribal arm tattoos, yellow lavalava with red flowers and Jandals. He must be carrying a machete in his right hand and a hachet in his left, and be surrounded in blue electric fire!